Shahid Kapoor is eagerly awaiting his second association with Vishal Bhardwaj titled ‘Haider’, an Indian adaptation of Hamlet, post which the actor will shift focus to the romantic drama ‘Shandaar’ directed by Vikas Bahl. Now, we hear that his sister Sanah Kapoor too will be a part of the film. While Shahid excitedly revealed that this is going to be a film which will have him along with his family including his sister Sanah and father Pankaj Kapur, the actor was careful enough to not divulge any details about the character his sister will be playing. However, it is being said that Sanah will be reprising the role of Alia Bhatt’s sister in the film. Also, Pankaj Kapur who will be sharing screen space with his son for the first time, will be playing Alia’s father in the film. 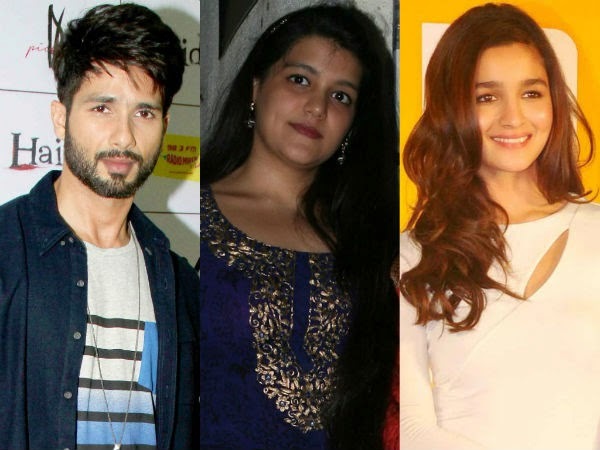 Shahid’s sister Sanah has completed an acting course from the Lee Stratsberg Theatre & Film Institute, a popular university in New York, U.S. She has now decided to venture into Bollywood following the footsteps of her father and her brother. On the other hand, Shahid Kapoor is currently busy with the promotions of Shraddha Kapoor, Tabu starrer ‘Haider’. He also signed Abhishek Chaubey’s Udta Punjab which is still in its initial stages. ‘Shandaar’ is a film about a lavish destination wedding and it is slated to go on floor in London, U.K. soon. Bollywood actor Shahid Kapoor, who will soon be seen in filmmaker Vishal Bharadwaj’s next ‘Haider’, wants to join hands with the director for the third time. Shahid collaborated with Vishal Bharadwaj for the first time in 2009 for ‘Kaminey’ . The actor, who is in London to promote the adaptation of William Shakespeare’s tragedy ‘Hamlet’, ‘Haider’, with the man himself, took to Twitter to share that he has been trying to convince the director for ‘Kaminey’ sequel. Shahid also thinks that the director is ‘lucky’ for him and has given him the best roles so far. “Vishal sir gave me so far the best role of my life in ‘Kaminey’. It is amazing to work with him again. It is a rare opportunity and very few actors get to play Hamlet,” Shahid said in an interview earlier. “When he (Vishal) wrote the script of Haider, he called me and said ‘You are very lucky. Whenever I cast you in any film, your role is written really well.’ I guess, he is really lucky for me,” Shahid said earlier. ‘Haider’, directed by Vishal Bhardwaj, is an adaptation of William Shakespeare’s Hamlet, and is set in Kashmir. The film stars Tabu, Kay Kay Menon and Shraddha Kapoor apart from Shahid Kapoor.